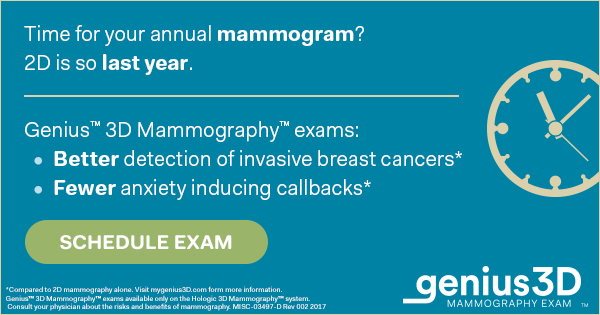 Mammography – Wayne Radiologists, P.A. Wayne Radiologists offers conventional 2D mammography as well as 3D mammography. 3D mammography is an advancement in women’s imaging that allows radiologists to examine your breast tissue one layer at a time. This makes detecting very small breast cancers possible and reduces the risk of false positive results. Finds cancers earlier than 2D mammography alone. Reduces unnecessary callbacks for repeat exams. During your mammogram the technologist will position you, compress your breast, and take images from different angles. The 3D mammography process is the same as the conventional 2D exam and there is no additional compression required. Will my insurance pay for 2D and 3D mammography? Most insurance companies cover annual 2D screening mammography. 3D mammography is charged in addition to a 2D screening mammogram. Some, but not all insurance companies cover the cost of 3D mammography. Because coverage and deductibles vary with all insurance plans, please contact your insurance company before your exam to see if it is covered. How will I find out the results of my mammogram? A written letter will be mailed to you containing the results of your mammogram. A final radiologist interpretation will also be sent to your doctor. If there is a need for additional images or an ultrasound of the breast, which is not uncommon, a technologist or your doctor will contact you directly. CALL US AT 919-734-1866 TO SCHEDULE YOUR MAMMOGRAM TODAY!